Dig out your old vinyl records and start playing them like the good old days! For many people, owning a turntable to play vinyl records provides a way to fondly remember the true, rich sound that turntables bring out from vinyl recordings. Reliving the nostalgia brought to life by vinyl records by artists ranging from Johnny Cash to The Beatles, to records by today’s newest recording stars brings people closer than ever before to their music. Vinyl records offer a rich, resonant sound that only music played on high quality turntables can provide. Here are ten of the best turntables we’ve found available today. See The Best Vintage Turntables Here! A simplified plug and play system. The Audio Technical Fully Automatic Stereo turntable, gives vinyl enthusiasts the chance to simply load the record onto the turntable and press play. This turntable is capable of toggling between 12″ and 7″ records, and can toggle between 33 1/3 or 45 RPM (revolutions per minute). The fully automated operation is accomplished through a belt driven turntable; a preamp that is switchable between phono or line-level output; and lift buttons that operate the tone arm. There is no need to touch the delicate tone arm. Simply touching the button causes the arm to hover above your recording and one more press of the button lowers it. It’s easy to upgrade this system with a new stylus. The turntable can also be connected to a computer for extra listening enjoyment. This turntable features classic styling combined with today’s most modern technological capabilities. It comes with two bookcase styled external speakers, along with a remote control. A 3 speed turntable lets you play your choice of 33 1/3, 45 or 78 RPM vinyl records. Listen to the built-in AM/FM radio or use the CD player for more music options. Vinyl records can be recorded to a MP3 format so users can share their music easily with others. 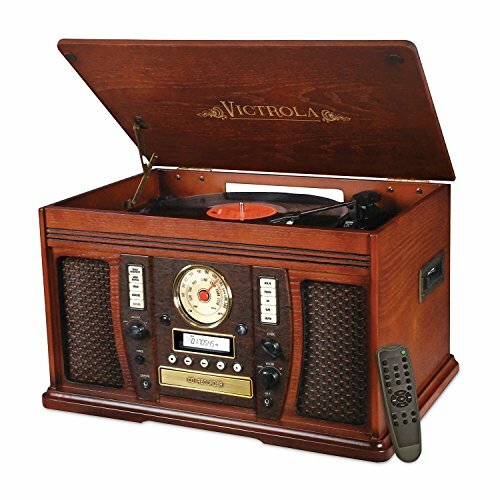 This unique Vintage Replica turntable effectively lets you combine a retro look, with today’s technological advances. Available in brown with a wood look, or black for a sleek look. Full sound in a turntable packed with extras. This is one of the best turntables for that all-in-one experience. The system comes with built-in speakers and out jacks to let listeners connect it to external speakers. It also includes a headphone jack for personal listening, AUX input and LED lights. Features 3 speeds in a contemporary looking system. Vinyl records that come in 33, 45 or 78 RPM can be played on this turntable. There are also SD and USB ports. This lets users record vinyl records into MP3 format and to play selections in MP3. The AUX-in feature lets users connect the unit to a smart phone, tablet or any other MP3 compatible devices. A good turntable choice for those who love hearing those old vinyl records in a simple way, with some of the niceties provided by modern technology. This traditionally styled, belt-driven turntable is capable of playing two speeds, 33 1/2 RPM and 45 RPM vinyl records. The pitch control is adjustable and the tone arm is s-shaped, which is an upper level upgrade. The unit features RCA phono output and auxiliary output. The adjustable counterweight helps to lower distortion and skipping. This turntable features a true, full and rich sound when it is paired with many types of speaker systems. It measures approximately 17.6 inches by 13.75 inches, by 6 inches, and weighs about 9.5 pounds. This precision crafted turntable features a low torque motor with direct drive, along with a 12-inch, die-cast aluminum platter. These additions give the Onkyo CP-1050 turntable a stable and precise rotation to lessen vibration and to create the clearest, most pure sound possible. Audiophiles know there is something magical about a crystal clear, analog sound and this is perhaps the best turntable in our list to provide just that. You can draw that desirable sound from your vinyl 33 and 45 RPM records when they’re played on precision crafted audio equipment. The MDF cabinet helps with keeping stray vibration at bay and features an attractive black wood-grain finish. 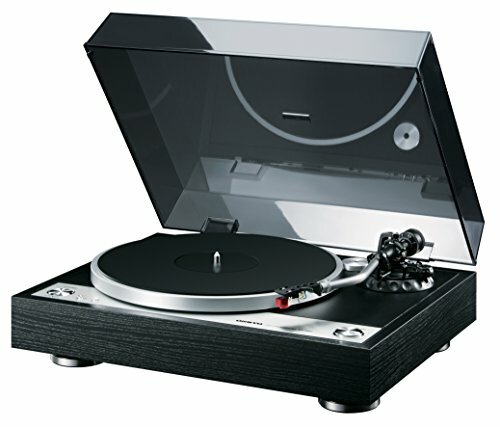 The Onkyo turntable also comes with a clear dust cover and phono outputs. The Orbit turntable comes with a low voltage, 24 volt AC synchronous motor that helps to keep the turning speed at a consistent rate. This helps with minimizing variations in pitch, also called flutter and wow. The motor is kept separate from the base, or plinth by using a specially designed rubber suspension. This acts to keep unwanted vibrations from infiltrating the sound, so what the listener ends up hearing is the pure sound of the record. The Orbit can play either 33 1/3 or 45 RPM records. The Orbit also comes with a dust cover, RCA cables, a felt mat and a guide to help with setup. This turntable is made in the U.S. and features a fast 30 second setup from the time it’s taken out of the box. This turntable seamlessly combines the look of a retro wood turntable with contemporary features to appeal to any audiophile. 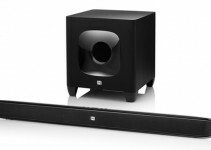 Rich sound has been blended with capabilities for Bluetooth. 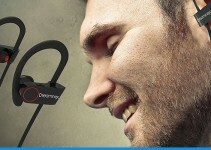 This allows users enjoy their favorite music with wireless sound that can be listened to on a phone or a tablet. The Aviator ITVS-750B turntable also features a USB, MP3 capability to let users listen to vinyl records or stream their favorite tunes. It comes with the capability to record vinyl to MP3. 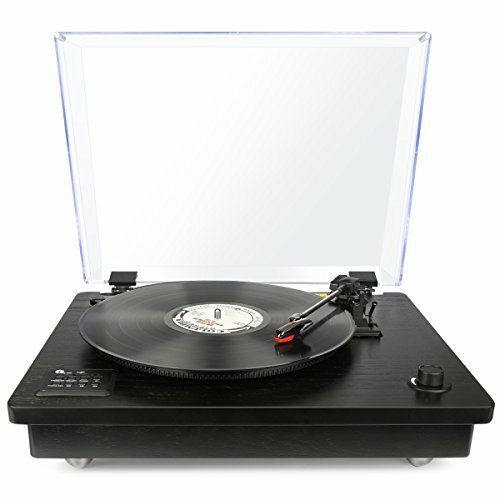 This turntable also comes with a 3.5mm Aux-in Jack so music can be played directly without a need for a Bluetooth connection. 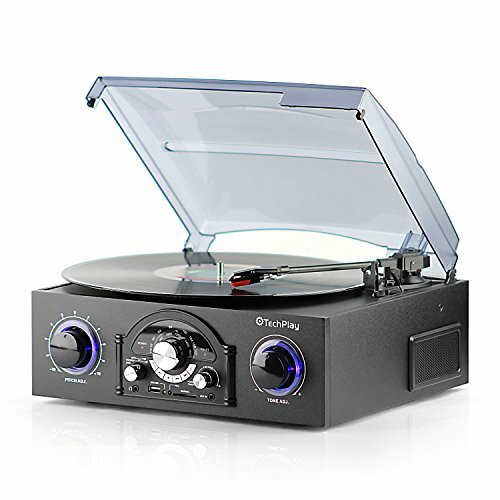 The 3-speed turntable gives users clear and crisp sound, providing them with an interesting blend of old style design with new audio enhancements. This turntable comes in a traditionally styled black or brown wood look finish. 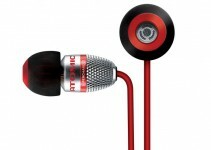 It features built-in speakers in a two-way system that creates a clear, full and rich sound. With vinyl to MP3 capability, songs can be transformed into the MP3 format so they can be listened to or shared. 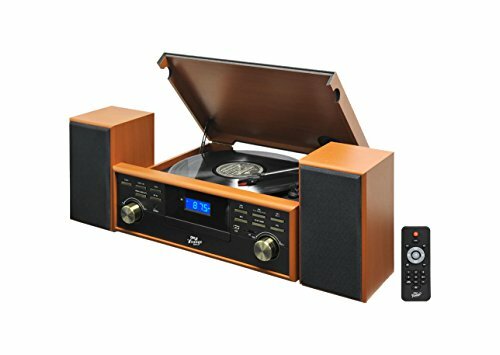 With this 1byone Bluetooth turntable, listeners have a choice to listen to all their favorite 33, 45 or 78 RPM vinyl format recordings. 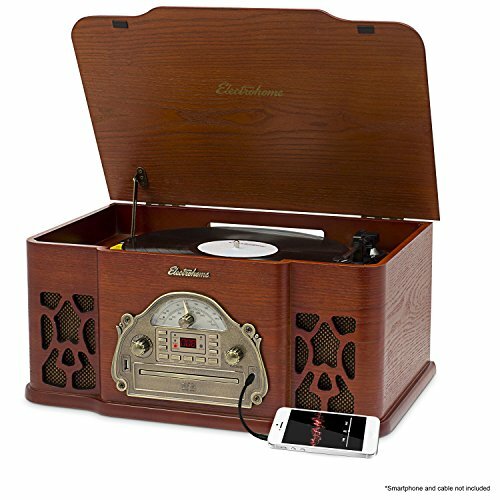 The Bluetooth capability means this turntable is fully functional with today’s devices, like iPhones, PC’s, tablets, Android or MP3 players. Measurements for this turntable are 16.9 x 13.9 x 6 inches and it weighs about 9.5 pounds. 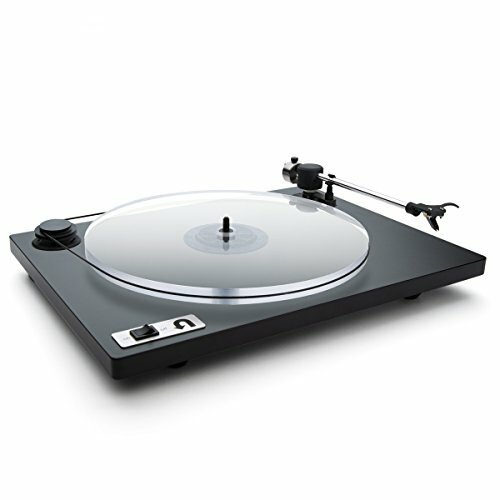 The 1byone turntable effortlessly combines a fusion of old style music with current technology. The Electrohome turntable features Aux input and a headphone jack, enabling listeners to hear all their favorite music privately. The ceramic needle on this unit gives listeners the most natural and warm tone possible, without causing harm to favorite vinyl records. 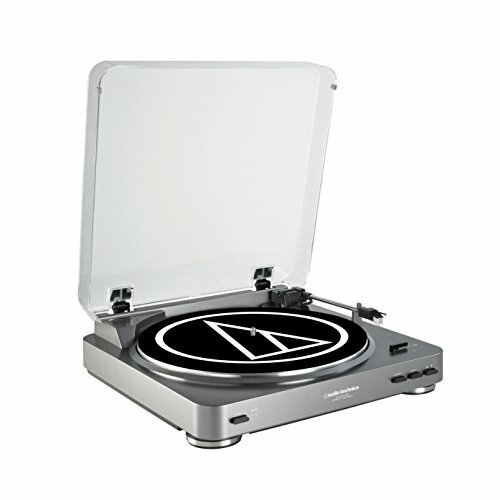 The turntable can play vinyl records, CD’s or MP3s by using the USB or Auxiliary input. With these, you can connect to devices like smartphones, iPad’s or iPhones or a tablet. Or, listen to the AM/FM radio. Another added feature is the ability to record music directly from vinyl to an MP3 device without using a PC. 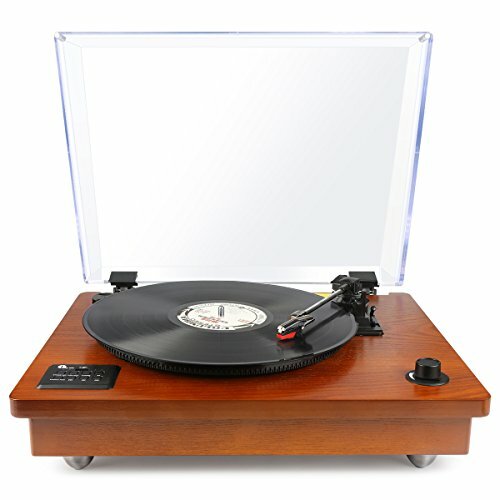 The Electrohome turntable is crafted with a wood cabinet in a mahogany finish. It features a retro look in its vintage design, perfectly blending in with other retro home decor. Vintage features include a patina face plate that is antiqued, amber lighting and a rotary styled knob. This Crosley turntable features unique Dansette turntable styling, which was most popular throughout the 1960s. Reminiscent of an antique record player, the Crosley Dansette turntable plays vinyl records in two speeds, 33 1/3 and 45 RPM. It is a belt driven unit and with a nod to modern styling, features a diamond stylus needle, speakers that give listeners a full, dynamic range and Auxiliary input and output capabilities. 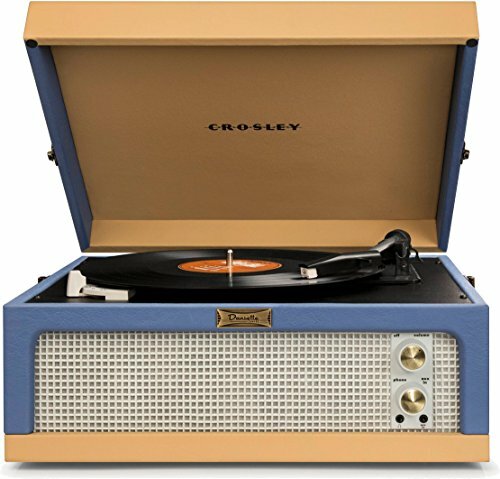 The Crosley CR6234A-BT seamlessly combines today’s quality materials with antique styling. In terms of size, this turntable measures 20 x 17 x 10 inches and weighs 19 pounds.